(a) A positive charge Q is spread over an semicircular arc with radius R as shown. (1) What is the work required to bring in a charge -q from infinity to the center of the arc? (2) Calculate the magnitude and direction of the force on a charge -q at the center of the arc. where q denotes the total charge of the sphere. Calculate the energy that it requires to deposit a charge Q on an initially neutral conducting spherical shell with radius R. Use two different approaches to come to the result. (3) Calculate the energy by incrementally adding a charge dq to the sphere. (4) Obtain the energy by considering the resulting electric field of the spherical shell. The electric field is a conservative field, the work does not depend on the path. V = kQ/R, k = 1/(4πε0), SI units. W = -kqQ/R is the work required to bring in a charge -q from infinity to the center of the arc. (2) The force will be F = Fj, pointing in the y-direction from symmetry. F = 2kq∫0π/2λRdθ sinθ/R2 = (2kqλ/R)∫0π/2sinθ dθ = (2kqλ/R), with λ = Q/(πR). W = (k/R)∫0Qqdq = ½kQ2/R. This is the energy stored in the charge distribution. (4) E = kQ/r2 outside the shell, E = 0 inside the shell. The energy density in the electric field is u(r) = (ε0/2)E(r)2. 4π∫R∞r2dr u(r) = (4πε0/2) ∫R∞r2dr k2Q2/r4 = [Q2/(8πε0)] ∫R∞dr/r2 = Q2/(8πε0R) = ½kQ2/R. In electrostatics, viewing the energy as being stored in the charge distribution or viewing it as being stored in the electric field leads to the same results. (a) Show that the plates of an isolated parallel-plate capacitor attract each other with a force F = (Q2/2ε0A), where ±Q are the charges on the plates and A is the area of each plate. (b) How does your answer to part (a) change if, instead, one maintains a constant potential difference between the plates of the capacitor? Energy stored in a capacitor: U = ½(Q2/C) = ½CV2. As we change the plate separation, the energy stored in the capacitor changes. ΔU = mechanical work done by external agent + work done by the battery. (a) The battery is disconnected, the charge on the capacitor is constant. U = ½(Q2x/ε0A), ΔU = ½(Q2Δx/ε0A) = FextΔx. Fext = dU/dx, F = -Fext = -dU/dx = -(Q2/2ε0A) = -U/x, the force is attractive. (b) The battery is connected, the voltage across the plates is constant. The force must be the same, however, the argument arriving at the expression is different. U = ½CV2, ΔU = ½ΔCV2. dU/dx = ½V2dC/dx, Q = CV, dQ/dx = VdC/dx. Assume you have two capacitors of capacitance C and ½C respectively, each holding a charge Q0. At t = 0 you connect then with wires as shown. (a) What is the energy stored in the capacitors at t = 0? (b) What is the energy stored in the capacitors at t --> infinity? We are asked to find the change in the energy stored in two capacitors when they are connected in parallel. For (1): U = ½Q02/C, for (2) U = Q02/C, for both U = (3/2)Q02/C. (b) C' = (3/2)C = capacitance of the capacitors in parallel. Q' = 2Q0. U' = ½ 4Q02/(3C/2) = (4/3)Q02/C. U - U' = (1/6)Q02/C. (c) In the quasi-static approximation we have Q1(t)/C - IR - 2Q2(t)/C = 0.
dQ1/dt = -3Q1/(RC) + 4Q0/(RC). Q1 = (4/3)Q0 - (1/3)Q0exp(-3t/(RC)). As t --> infinity, Q1 --> (4/3)Q0, V1 --> (4/3)Q0/C, independent of R.
Energy dissipated: E = ∫0∞I2Rdt = Q02/(6C). This is exactly the difference in the energy stored in the capacitors at t = 0 and at t = infinity. It is independent of R and does not change if we make R very small. Three identical capacitors (capacitance C) are connected in series to a source of electric potential V. The capacitors are then individually disconnected from the source and wired in a new, series-parallel circuit in which two capacitors remain in series in their original orientation and the third is placed in parallel with the first two, with its positive plate connected to the positive end of the series pair, as shown in the figure. Find the new potential difference, V', of the combined capacitors. We have to consider different arrangements of three identical capacitors. 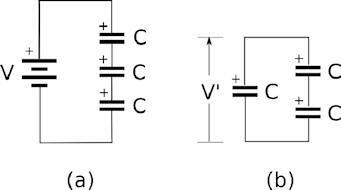 In configuration (a) the charge on the upper plate of each capacitor is Q = CV/3. In configuration (b) the total capacitance is C' = C + C/2 = (3/2) C.
The total separated charge is Q' = 2Q. V' = Q'/C' = 4V/9. A battery with voltage V charges a capacitor with capacitance C. At t = 0 the battery is disconnected. The positive plate of the capacitor is then connected to one plate of a previously uncharged identical capacitor by wire with zero resistance. The negative plate of the charged capacitor is connected to the other plate of the second capacitor. (c) Explain the difference from the point of view of the energy conservation. We have to consider different arrangements of two identical capacitors. (a) For a capacitor, U = ½Q2/C = ½ CV2. U = ½Q2/C, Q = CV. (b) C' = 2C = capacitance of the capacitors in parallel. Q' = Q.
U' = ½Q2/C' = ¼Q2/C, U - U' = ¼Q2/C = ½U. (c) The electric force does work on the charges when they move. Since as t --> infinity the charges are again at rest and have no kinetic energy, the work done by the electric force is dissipated in the form of thermal energy or radiation. In the quasi-static approximation we have Q1(t)/C - IR - Q2(t)/C = 0.
dQ1/dt = -2Q1/(RC) + Q/(RC). Q1 = Q + (Q/2) exp(-2t/(RC)). As t --> infinity, Q1 --> Q/2, V1 --> V/2, independent of R.
Energy dissipated: E = ∫0∞I2Rdt = Q2/(4C). Two isolated spherical conductors of radii 3 cm and 9 cm are charged to 1500 V and 3000 V, respectively. They are very far away from each other. (a) What is the total energy of the system? (b) If we connect the two conductors by a fine wire and wait until equilibrium is established, how much heat will be generated in the wire? Initially we have two isolate spherical capacitors. We then connect them in parallel. U = 2πε0(R1V12 + R2V22) = 4.875*10-5 J. The total charge on the capacitors is Q = Q1 + Q2 = C1V1 + C2V2 = 4πε0(R1V1 + R2V2). (b) We have two capacitors in parallel with total charge Q and capacitance C = C1 + C2. The total energy stored in the system now is U' = ½Q2/C. Two identical metal plates of area A each are arranged as shown: the top plate is suspended by a spring with a force constant k and the bottom plate is mounted underneath so that it does not move. When both plates are neutral, the equilibrium distance between them is h. If the plates are connected to a power supply, what maximum voltage between the plates would not cause them to touch and maintain a stable equilibrium? The electric force and the restoring force from the spring point in opposite directions. When they have equal magnitude we have an equilibrium position. We have to find the condition for the equilibrium to be stable. When the plate separation d << A½, the plates can be treated like a parallel plate capacitor with capacitance C = ε0A/d. The field energy stored in the capacitor is U = ½CV2. If we change the plate separation, the field energy stored in the capacitor changes. = -½V2dC/dx, since Q = CV. Fext = ½ε0AV2/x2. Felectric = -Fext = -½ε0AV2/x2. k(h - x') = ½ε0AV2/x'2, or V2 = (2k/(ε0A))(hx'2 - x'3). For a stable equilibrium we need a restoring force for small displacements δ from equilibrium. Ftotal(x' + δ) = k(h - x' - δ) - ½ε0AV2/(x' + δ)2. We need dFtotal/dδ|δ=0 < 0.
dFtotal/dδ|δ=0 = -k + ε0AV2/(x' + δ)3|δ=0 = -k + (2k)(hx'2 - x'3) /x'3 = -3k + 2kh/x'. We find Vmax by setting dFtotal/dδ|δ=0 = 0. -3k + 2kh/x' = 0, x' = 2h/3. Vmax = [(8kh3/(27ε0A)]½. We have one dipole in the external field of another dipole. The energy of a dipole in an external field is U = -P∙E. Consider dipole P2 in the external field of dipole P1. Choose your coordinate system such that P1 is at the origin and P2 is at R.
Field of P1 at R: E(R) = 3(P1∙R)R/R5 - P1/R3, (Gaussian units). Energy of in this field: U = -P2∙E(R) = P1∙P2/R3 - 3(P1∙R)(P2∙R)/R5.